There is a word in Greek (thaumazō) that Luke used to describe what happened when human beings witnessed the power and glory of God. It is alternatingly translated as “to wonder, to be astonished, to be amazed, to marvel, and to be surprised”. It is the response of the people of Bethlehem after hearing the shepherds declare the birth of the Savior and the disciples after Jesus calmed the wind and the waves. It is how multiple people reacted to the miraculous acts of the Lord and how Peter felt when he saw the empty tomb. Throughout the Gospels, men and women come face-to-face with the words and works of God and are amazed. This experience of occasional astonishment is, in my opinion, a stark contrast to those who attend our twenty first century worship services. When was the last time you wondered at the meaning of the words found in the Scriptures or were surprised by the works of the Holy Spirit in our midst? When was the last time God broke through the mundane and you marveled at the world around you? In our day and age, our impressions of life on earth is more like that of the author of Ecclesiastes: there is nothing new under the sun. Where has all the wonder gone? I believe we get from life and from others what we expect from life and from others. Beyond “glass-half-full/glass-half-empty” biases, we see what we want to see. We are not surprised by God, either through His miraculous works or His marvelous words, because we do not think we will be. Babies are born and all but the immediate family shrugs. Healing comes to those who are sick and most of us yawn. Accidents are avoided by random delays and we are oblivious. Then we consider the biological functions necessary for sustaining life and the explosive power of the combustion engine, it is amazing that we “live and move and have our being”. Last weekend, with its reminders of the sacrificial death and glorious resurrection of Jesus, ought to pique our interest in the amazing. Easter is a lasting witness to the wonderful and marvelous works and words of God. It reminds us that while His claims may sound fantastic (i.e. based on fantasy), to our amazement they have all been proven true. This week, in communities of faith gathered in worship and in places of solitude intended for reflection, we allowed ourselves to be amazed, if only for a moment. I wonder what would happen if we allowed ourselves to look for the surprising every Sunday morning, or every morning for that matter. I pray that this week you hear something amazing, see something wonderful and sense something marvelous. Let me know when you do. Today is Good Friday, the day in which the Church remembers and reflects upon the death of Jesus. Each year, I focus on one of the gospels as they relate the events of Palm Sunday through Easter. This year I have been reading through Luke’s account of the Lord’s final days and am struck by what the good doctor states is Jesus’ final utterance (and arguably His “famous last words”): “Father, into your hands I commit my spirit.” In saying this, He is quoting from Psalm 31:5 and restating the assurances that David made of God about a thousand years before the cross. From the context of Psalm 31:5, I do not believe this is a simple statement of resignation, as if Jesus is saying, “I give up”. Rather, it is a statement of confidence in the Father. Psalm 31 tells us that David saw his strength as coming from the knowledge that God is his refuge, deliverance, rescue, rock and redemption. It is in light of all this that David places all that he was, every aspect of himself beyond his physical existence, in the hands of God. Similarly, this is the same confidence that Jesus expresses from the cross. This phrase is akin to the words that Jesus spoke in the garden a few hours earlier, “… not My will, but Yours be done.” It conveys the confidence that Jesus had in knowing that the plans of God and the guiding hand of God can be trusted. As the agony of the cross began to overwhelm the limits of His human body, Jesus doesn’t give up, but rather gives over control of His existence to the only one who can perfectly accomplish God’s will, the Father himself. And He is faithful, releasing Jesus from His mortal coil and redeeming us, lost sinners, from the power of death and sin. I pray that I’d have the confidence that David expressed or that Jesus exhibited. Sadly, I often see the opposite dynamic at work: when the going gets tough, I want to take matters into my own hands. Instead of committing my spirit into God’s hands, I futilely attempt to handle my trials and troubles myself. Instead of acting like David (who just prior to committing his spirit to God asks Him to “keep me free from the trap that is set for me”), I am more likely to stumble into danger by relying on my own sense of direction. How much pain could be avoided if I committed my spirit to His hands. It is hard to see the empty tomb when we are enduring what, for us, seems to be the cross. It is at those times that we need to trust the hand of God, which comforted the Lord, rolled away the stone and raised the Savior. It is also the hand that can comfort, strengthen and save us. I am praying that you have a blessed Good Friday and a Happy Easter. Ma: You’re gonna love it. As I have shared before, my wife and I have seen all the films nominated for the Oscar© for Best Picture. One of those films, Room, has been on my mind. Room tells the story of Ma, a young mother who was kidnapped at 17 and has spent the last 7 years being held captive in the titular space, and Jack, Ma’s 5 year-old son. Early in the movie the audience realizes that everything Jack knows is found in “room” and his frame of reference is exclusively “room” – he thinks that “room” is floating in space and everything he sees on the small TV in “room” is make-believe. In a pivotal scene in the picture, Ma devises a plan to escape and decides to prepare Jack for life outside “room”. Using the reference of the TV shows Jack has seen, she explains that trees are real and people are real, that streets and cars and dogs are real. Jack is incredulous. He cannot comprehend life outside of his eight foot by eight foot by eight foot understanding of all that exists. He even gets mad at Ma for lying to him, with her pretending that there would be something more than “room”. Watching this interaction was gut-wrenching because I can identify with Jack’s inability to process the unknown. Room has been in my thoughts because I picture the disciples of Christ feeling just like Jack as the prospect of the crucifixion loomed in the future. Jesus had told them, on at least three occasions, that he was going to Jerusalem to be killed and then they would see him again. They were incredulous. They could not comprehend life beyond their frame of reference. They could not believe that Jesus would escape death’s grip and fulfill his outlandish claims. One of them, Peter, even voices in anger that what Jesus claims must never take place. It just could not possibly be true, could it? The disciples saw and believed. All those fantastic promises were true. Reality is so much greater than our ability to process it. The one who had seen life beyond the barrier was right about all of it. There is life and freedom, joy and reunion just on the other side. The question I have is this: do you and I live like Jack or like Ma, like the disciples at the Last Supper or the disciples after the risen Jesus appears in the upper room a few days later? Do I trust in all that I know or know that the one I trust has provided me with more than I can ask or imagine? We, who live on this side of the empty cross, are blessed that we need not live in spiritual captivity or the confines of the limits of our human experience. We can live in the light of the empty tomb and be encouraged by the conquest of Christ, who has secured for all those who trust in Him a future that our brains cannot fully comprehend. Imagine there is an important announcement to be made, whether it is a major press conference in Washington, DC or a major product unveiling in Cupertino, CA. Now imagine that instead of the President of the United States or the CEO of Apple© the announcement is made by someone from the janitorial staff. The message may be completely clear, concise and compelling, but it would be unusual. We have a mental picture of authority (right or wrong) and we tend not to treat those who fall outside that perception with the same respect that we afford those who fall within it. Last Sunday, as I was expounding Mark 16, I was reminded again that God messes around with our cultural perspectives all the time. Who was it that was given the task of making the greatest announcement of all time? 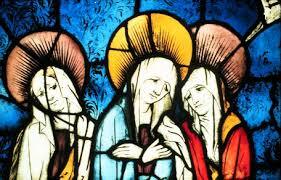 Not the religious leaders, nor the political leaders of that time, but three women. This is particularly shocking due to the fact that females in 1st century Palestine were regarded as having a societal value only slightly higher than that of livestock. They were not heard or heeded, let alone given the platform to preach or teach. However, God doesn’t shape His callings according to societal norms. That is just the way God is, elevating the ordinary and setting apart the simple. When He decided to announce the Savior’s birth, He used holders of the lowest of occupations to do so. When He selected the twelve who would carry on the work, he called fishermen, a tax collector and half a dozen unknowns. Any cursory reading of the Bible gives example after example of God’s raising up what society disregards. The least in his family (David) becomes the great king. The least in the community (Gideon) becomes the great warrior. One with a speech impediment (Moses) becomes the great prophet. One with the lowest moral standing (Rahab) becomes a great deliverer. This lasting and repeating reality is a fountain of hope for those of us who are ordinary (or maybe even less than ordinary). It is a good reminder that God’s great truths can come from unexpected sources – small Sunday school classes, stammering sermonizers, saintly women and scruffy sanitation workers. What a blessing to know that God can, and does, speak through anyone of any standing whose heart is found in Him. A few weeks ago I had the joy of shopping at Trader Joe’s®. I like shopping there: they have great wholesome food at really good prices. 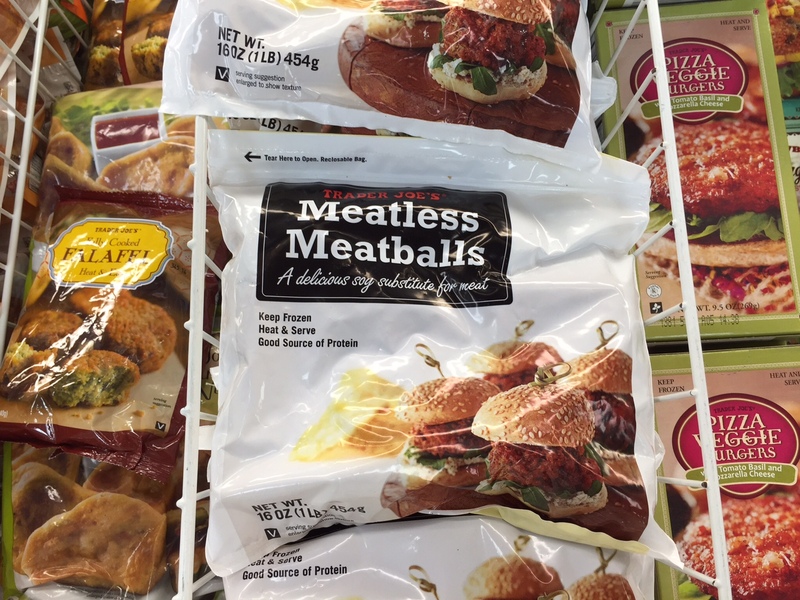 As I was walking down the aisle of frozen foods, I came across a peculiar item – ‘Meatless Meatballs’. Before posting a hurtful comment about my obvious insensitivity toward vegetarians, let me state that I have no problem with the product; I have a problem with the name. Perhaps they are just as advertised, a delicious soy substitute for meat, but can it really be called a meatball? I assume that a meatball contains meat. This product got me thinking, though, about Easter. Why do we have ‘Easter Egg Rolls’ sponsored by those who have no desire to commemorate the reality of Easter, the resurrection of Jesus? Why not call them “Decorated Egg Rolls” or “Seasonal Egg Rolls”. We ought to also come up with a term for the irreligious to use for the big bucket of candy we leave out for kids on the first Sunday after the first full moon after the vernal equinox (I thought about suggesting “big candy bucket”, but I think that belongs to the last day of October). It seems wrong to use the word Easter if it contains no Easter in it. Easter is a time to remember why we are celebrating, not just a time of celebrating. We remember and celebrate that death has no power over those who trust in Jesus. We remember and celebrate that Satan has already been defeated and his reign will certainly come to an end. We remember and celebrate that we are loved so completely by God that nothing in all creation could ever separate us. That is why we ought to include Easter in our celebrations. It would be a shame to accept an inferior replacement for the true joy and majesty the resurrection provides. I hope that you have the opportunity, between dyeing eggs and feasting on ham, to engage in worship this Sunday. I would consider it a privilege, if you are in Dorchester, to worship with you at Calvary (breakfast at 9:30 and worship at 11). I truly pray that you will not enjoy an Easterless Easter – a pleasant, but unsatisfying, cultural substitute for a personal relationship with the Lord. Happy Easter to all. In the course of events throughout my life, I have come to realize that God must have a sense of humor. I have an unofficially diagnosed condition called ornithophobia, an irrational fear of birds. The reason I concur that God has a sense of humor is because He has chosen to allow circumstances to place me in alarmingly close proximity with the feathered fiends. There was that time when we brought our Christmas tree into the house and swept a little bird in with us. There was also the time that a window at church was left open on a Sunday morning and a bird flew in and spent most of the worship service perched on a ceiling fan. And now there is the ‘nightmare’ I face that every morning as I am awakened by birds perpetually perched upon my bedroom window ledge. 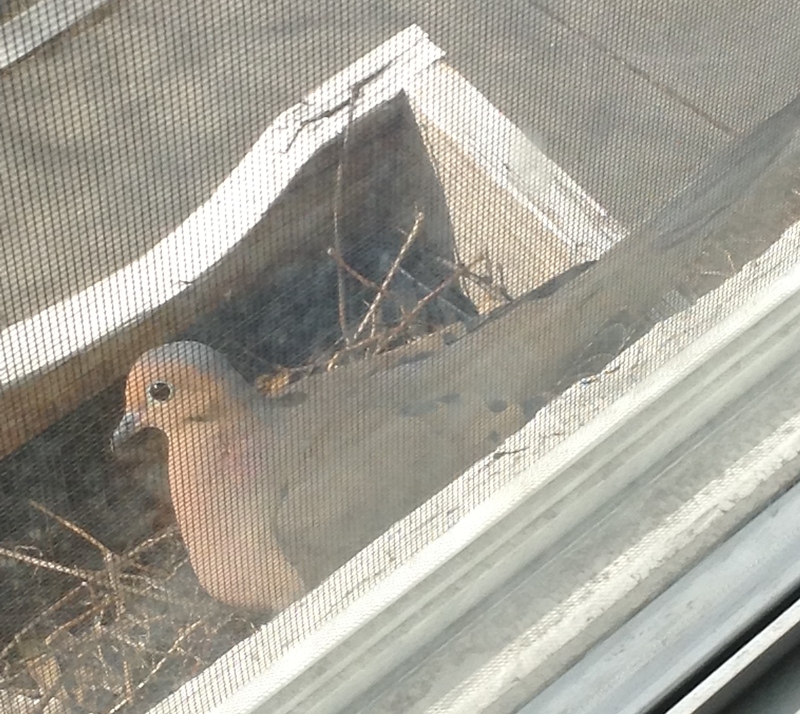 To add to my heightened awareness of my fears, we are also dealing with a mamma bird, with her two eggs, nesting just outside our flower box and staring at me. I can rationally reconcile in my mind that I will not be dive bombed by a hawk, but there is something in my mind that is still at work reminding me to be afraid. God knows the fears we face; some are irrational (like my fear of birds) and some are real (like the disciples’ fear of the leaders of their day). God also knows what we need when we face fears of any kind – peace. This peace that the Lord promises is more than an absence of conflict (the antithesis of war); it is the warmth of contentment and well-being even in the midst of the storm. We all have things that fill us with fear – death, disaster, public speaking – and we all have access to the one who can dispel all that fear – the Lord Jesus. The great hope for life on this side of the empty tomb is that Jesus has conquered all that makes us afraid. He has afforded us victory over Satan’s wiles, sin’s influence and death’s sting. He has given us peace, His perfect peace. 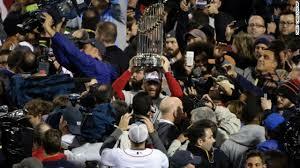 On Monday afternoon, the Boston Red Sox will begin the process of repeating as World Champions. After 5 months of waiting for the season to begin, our hometown baseball team will take the field in defense of their World Series trophy. The Sox, due to their success last year, is at a distinct disadvantage this year: every other team in Major League Baseball would like nothing less than defeating the champs. In addition to that, every team, including the Sox, have had their records wiped clean; everyone starts the season on an even footing with no wins and no losses. Athletic competition is merciless. This was demonstrated last month at both the Winter Olympics and the Super Bowl. Gold medalists must compete and if they have a bad day on the ice, in the half-pipe or on the slopes they are no longer gold medalists. And just because you enter the stadium with football’s most potent offense and have secured a number of the NFL’s scoring records doesn’t guarantee you will leave with the Lombardi Trophy. Unfortunately, for the athlete the competition is new every season and one is not able to rest upon past successes. Imagine that there was a contest where, upon the final victory, the competition ceased and the final records were secured for all time. What if there were no more boxing matches, basketball games, swim meets or marathons and whoever is the current champion maintains the title forever. Now imagine you are that contestant, the competitor who secures the final win. There would be such joy in knowing that the victory can never be taken away and that you will henceforth be known as the victor. Wouldn’t that be wonderful? Whatever your athletic ability, or intellectual power for that matter, God has afforded you a victory against a formidable foe. From the beginning of all time death has been our enemy and each and every human being, when challenged by death, has lost the battle. Every human being, that is, until Christ. In about three weeks we will celebrate Easter, the date on the Christian calendar where we rejoice in the sudden and certain victory of our Savior over death. Like many epic battles, it looked like it could have gone either way: the aggressive offense of the Devil in the early moment s of the game, the apparent lack of a defensive game by Jesus, a team defection in the second half, and the killer blow as the clock was winding down. Satan started the celebration before the final bell rang, savoring his apparent win. It was at that moment that the champion, Jesus Christ, rose up and claimed the final and lasting victory – and we, the bench players who never needed to do anything more than dress for the game, were awarded the victory with Him. Hallelujah and Happy Easter! I encourage you to participate in the “holy rolling” rally on Sunday, April 20th.